In 2008, Noria celebrates its ten-year anniversary. As part of that celebration, we reflect on the success of its magazines and the inspiration behind Noria Corporation. Noria Corporation is named after this early and most-essential water wheel machine. The word "noria" comes from the Arabic term, Na-urah, meaning "the first water machine." It was the earliest mechanical device propelled by means other than man or animal. The noria was an inevitable invention that sparked the development of countless types of hydraulic and rotating machines. Over the centuries, it has allowed civilizations to nourish their villages and crops with water, the most fundamental of resources. In time, this triggered the beginning of a new era - the turning of arid lands into prosperous empires. Unfortunately, there are limited historical accounts describing these ancient machines, making much of the story about the noria a bit of a mystery. It is uncertain when and where the first noria came into existence. Yet some information does exist to help piece together a possible evolution of the noria and subsequent machines. The following is a brief summary of this early chronology based on available historical and engineering references. The most common description of a noria is a water wheel used for raising water from a river so that it can flow by gravity via aqueduct to villages and cultivated land for irrigation. Today, various types of machines are referred to as norias, with differences in structure, power sources and purpose. Some apply the term noria to refer only to water wheels used to elevate water powered by the flow of a river. Others use the term for a variety of water-lifting wheels or devices, whether it is rotated by animal, man power or river, including those that function as pulleys with buckets attached to chains or ropes used for obtaining water from a well where the water table is low. Using this broader definition, norias can be either animal or water-powered, depending on the source of water. When water is lifted from wells, the wheel is typically turned by an animal. The rim of a second wheel, placed horizontally, touches the rim of the vertical wheel at a 90-degree angle. One of the two wheels has a series of pegs protruding from the rim parallel to the axle of the respective wheel, making each wheel, in effect, a gear. A long pole or draw bar is attached to the horizontal wheel parallel to the ground, and a mule is typically harnessed to this pole (walking around and turning the wheel) to lift water from the well. The noria, used for raising water, was a type of undershot water wheel that activated no machinery beyond itself. It was a large, vertically situated wheel, sometimes as much as 50 to 80 feet in diameter, equipped with radial blades or paddles that rotated the apparatus as they were impacted by the flowing water that came into contact with the lower immersed portion of the wheel. Buckets or pots made of wood, bamboo or pottery were attached to the rim of the wheel. As the machine rotated, the buckets filled with water, which was carried upward and spilled near the top of the wheel into a trough. The buckets then returned empty to the bottom of the wheel to repeat the process. In early civilization where the land was dry, a convenient method was needed to bring water to the crops. 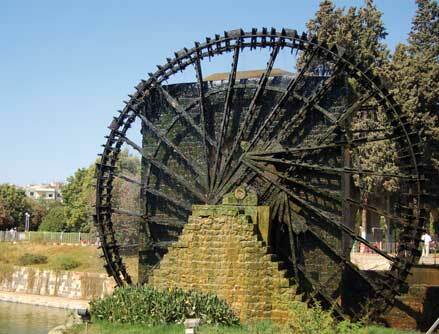 This basic necessity spurred the invention of the noria to lift and move water. The widespread distribution of these machines in antiquity indicates that farmers long ago had a need for more water than direct rainfall alone could provide. Norias are axiomatically associated with dry lands.2 The invention of the noria was clearly an enormous leap forward in both technology and the cultivation of land. A machine is any device capable of making mechanical work easier, typically by overcoming a force of resistance (the load) at one point by applying a more convenient force (the effort) at another point. While the origin of the first noria remains a mystery, there are a few references to the noria in early literature that provide an idea of when they were first introduced into society. An important citation from the writings of Vitruvius mentions norias and other water-lifting devices, suggesting they may have been introduced to Rome in the first century B.C. However, due to evidence documented in Indian texts dating from around 350 B.C., Joseph Needham believed that the noria was developed in India around the fifth or fourth century B.C. After its invention, he assumed it spread to the west by the first century B.C. and then diffused to China by the second century A.D. This was followed by widespread use of the noria in the eastern Mediterranean in the fifth century A.D. before reaching North Africa and the Iberian Peninsula in the 11th century. Other possibilities of origin include the Near East around 200 B.C. Manuscripts of the Pneumatica of Philo of Byzantium, a Greek technician from the late third or early second century B.C., show pictures of several distinct types of water wheels. Among these is what appears to be a vertical undershot water wheel used for hoisting water. This may not necessarily be a noria, but it is a good indication of when machines of this kind began to emerge. The vertical undershot mill likely originated in Asia Minor. The overshot vertical mill probably came after the noria and the horizontal water mill. It could have been an offshoot of the undershot mill. Reynolds gave three good reasons for believing that the noria, for water lifting, evolved into the vertical undershot milling machine providing shaft power. First, the literature places them in that order of time and in the same region, the Mediterranean basin. Second, Vitruvius, the first person to ever describe the two machines in detail, explained the functioning of the undershot mill in terms of the noria. Lastly, the vertical water mill was a more sophisticated engine than the water-lifting noria. In addition to the vertical wheel and the horizontal axle it shared with the noria, the vertical undershot mill had right-angle gearing which transformed the vertical-plane rotary motion of the water wheel to the horizontal plane, where it activated a pair of millstones. He thought that the vertical undershot mill combined the noria with the rotary millstones of the hand-powered quern using gearing. In China's history, the progression of water power seems to be quite different. In the West, water power was first used to raise and transport water using the noria, which evolved into more complicated tasks in industry to do work by means of rotary and reciprocating action. In China, on the other hand, it began with water-power reciprocating motion that wasn't seen in the west until much later. Referencing early Chinese literature, Reynolds theorizes that it wasn't power coming from a water wheel that allowed for these tasks but rather power from the water lever, an early naturally reciprocating mechanism. There is some possible evidence of water wheels in early China, but they were likely derivations of the western norias. Because the Chinese had developed geared machinery from an early age, it is likely that they powered these mechanical devices using water wheels and norias that were originally advanced in the West during the Hellenistic Age. Information gathered from the works of various medieval geographers and historians indicates that by the 11th or 12th century A.D., water wheels were in use from one end of the Islamic world to the other. There is documentation of watermills in Spain, Palestine, Syria, Mesopotamia, Azerbaidzhan (in the former Soviet Union), both western and eastern Persia, Turkistan, Afghanistan and Pakistan. The noria, in particular, was widespread in Syria and Spain. Because the only evidence of their existence is ambiguous and scarce, sadly, it is not easy to explain the evolution of these important early machines. The truth is that history supplies no concrete sequence of events that brought about these water machines. Unlike Darwin, who gave the term "evolution" a whole new meaning by applying it to animals, there are no remains to examine or live animals to observe. Most of these machines were used for a time and then destroyed to build newer and more advanced ones, leaving little evidence of their ancient history. It is easy to speculate that perhaps the noria marked the beginning of the modern-day machine for which lubricants were first applied to control friction and wear. While the noria is probably the first machine not powered by man or animal, the wheel was invented much earlier than the noria. Examples of early chariots were found in the tombs of Yuaa and Thuiu in Egypt dating to 1400 B.C. with residue of a grease-like substance on the wheels. From this, one could conclude that lubricants were applied at the inception of the noria. Much has changed since the early days of the noria, but the need for machinery reliability remains steadfast as an engineering imperative. In fact, we could say that the noria not only chronicles the evolution of the machine but it also stands as an icon for machine reliability. Consider the report that in Syria a noria has been in continuous operation for more than 1,000 years! Noria Corporation is named after the historic and essential water wheel machine, the noria. 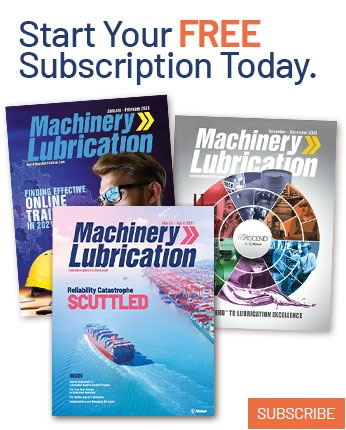 Along with Machinery Lubrication, the company also publishes Practicing Oil Analysis and Reliable Plant magazines, as well as a Lube-Tips e-mail newsletter. In addition to publishing, Noria provides training courses and consulting services to help companies achieve world-class machinery lubrication and/or oil analysis programs. Noria also presents conferences and exhibitions to keep professionals up-to-date in their quest for lean manufacturing, improved reliability and lubrication excellence. Aubrey Burstall. A History of Mechanical Engineering. p. 94-97. William Doolittle. Against the Current and Against the Odds: Noria Technology in Mexico. Thomas Ewbanks. Descriptive and Historical Account of Hydraulic and other Machines for Raising Water, Ancient and Modern: With Observations on Various Subjects Connected with the Mechanic Arts: Including the Progressive Development of the Steam Engine. New York: H. W. Derby. 1856. Forbes. "Studies in Ancient Technology." Nina Nelson. Your Guide to Syria. Alvin Redman, London. p. 140-142. Terry Reynolds. Stronger than a Hundred Men, a History of the Vertical Water Wheel. The Johns Hopkins University Press, Baltimore and London. p. 11-27. L. Sprague De Camp. The Ancient Engineers. Doubleday & Company, Inc., Garden City, NY. 1963. Hugh Vowles. Early Evolution of Power Engineering. p. 408-415. Oxford's Dictionary of Science. 1999. Rosita Fitch is the daughter of Jim Fitch, founder and chairman of Noria Corporation. She currently teaches in the public school system in Decatur, Georgia.